CSAD IoT Automated Crop Care System is a scalable system with automated watering, cellular connectivity and historic cloud sensory data. Optional, for water distribution parts, tube adaptors etc. This project has been submitted for the "Exploring Cellular IoT with Hologram Nova and Raspberry Pi" competition on Hackster.io. We are still working on the project but it is now locked for editing so we can't share updates right now - more to come soon!! The biggest problem we are suffering with is keeping the project water tight. We upgraded to 8mm (inside diameter) tube which made it much easier to 3D print parts and also eased pressure in the system. We also managed to print a good adaptor for the Adafruit Valves which works great with a little teflon (plumbing) tape - so the water works are finally good. The new problem that has emerged however is the planter edges have split under stress with the project being moved around over the last few weeks, we had some hairy moments as a result!! The planter definitely needs a rework. Drainage isn't great, we will remove all the soil substitute at some point soon and place a layer of gravel at the bottom of the planter to try to improve this. Despite the cover photo showing a packet of tomato seeds, the planter is pretty small so planning to grow vegetables in it was probably a little ambitious - but it could be perfect for herbs! A selection of herbs would have different requirements for soil moisture retention, watering and drainage - so the cloud data would be really helpful in refining watering routines over time as it gives a good indication of drainage over time. So, stay tuned for our growing adventures! The CSAD IoT Automated Crop Care Project is a proof of concept for a scalable crop care system that features a variety of ambient sensors, automated water distribution and cloud connectivity to monitor historic data and perform analytics with a cellular broadband interface. Our model includes a filtration system and a water reservoir which can recycle water, and an SMS alert system for the reservoir water level that can easily be adapted for other alerts. The system is based on the Raspberry Pi Zero W, the Hologram Nova USB cellular modem, Catnip Electronics i2c soil moisture sensors and the ThingSpeak Cloud IoT service. The intention behind this project is to create/contribute to the growing world of open-source systems for crop care automation. We want a system that can be easily scalable to your individual needs - it could be a fun indoor system for a couple of potted house plants or could work for an allotment patch with a wide variety of plants with different needs. Larger projects are feasible in theory, but are not particularly covered in the scope of this tutorial, any comments towards this are of course welcome! A Raspberry Pi Zero W is at the centre of this system. A set of python scripts running on the Pi collect data from the sensors, reactively control a DC pump and solenoid valves and push data to the ThingSpeak IoT cloud service. The Hologram Nova cellular interface grants portability and the option for setup in more remote locations (providing there is a 2g/3g cellular service), and also allows for SMS alerts to be sent to the user. We used the excellent Catnip Electronics i2c Soil Moisture Sensors, which are weather proof and provide data for soil moisture, temperature and light levels. The i2c protocol makes these sensors stackable as they can be wired in parallel, so a good number of them could be used if required for a particular application. For a small system like our concept model, a single ULN2003a Darlington Array is pretty much the only extenal component required between the Raspberry Pi and the pump / solenoids. The solenoid valves are normally closed, and only draw current when activated to open the valve. The system only needs to water one location at a time, so only one solenoid and the dc pump would be active at any given point - so again, the system can be scaled up by simply adding more water distribution with solenoid controlled valves, this doesn't require any modification to the power supply. Our concept model has three planters with drainage that falls into a simple filtration unit, and then into a reservoir. This is a closed system that requires topping up with water occasionally, but could just as easily be an outdoor rain water collection / filtering system for the reservoir. The concept is simple and is similar to a number of other diy projects, if the soil moisture sensors detect that soil in a designated location has become too dry, a valve within a tubing network will open to direct water to that location, and the dc pump will activate to push water through the system and to that location. This concept is enhanced in this model by including the cellular interface, allowing for remote installation, remote access to sensor readings and SMS alerts for the user. We laser cut a small 3 pot planter out of 5mm clear laser acrylic which looks great! Illustrator files are included if you want to copy or modify our design, but your system could be any indoor or outdoor configuration. Our unit has 2 main parts, a removable top with 3 planters and a base with filtration, water reservoir and houses the electronics. Although we haven't tested it yet for planting, the pots have a soil substitute called coco compost. This substitute isn't particularly good for water retention so we added perlite to the mix. The coco compost comes in a dry block and needs to be hydrated, and expands like crazy once it has been! We used a single 10L block to fill the planter with about 2 cups of perlite mixed in. We are now using 11mm aquarium tubing (8mm inner diameter) to move water around the system. Adaptors and splitters were needed to connect tubes together and to the pump and valves - we 3d printed all of these parts on an Ultimaker 2+ with a 0.6mm nozzle. The Adafruit Valves needed a couple of wraps of teflon (plumbers) tape around the thread in order to stay water tight, but the print should otherwise work great! Each planter has a Chirp! i2c capacitive soil moisture sensor made by Catnip Electronics. These sensors are based on the ATTiny441 and have been sealed in epoxy resin for rugged weather proofing. The resin doesn't have a major impact on the sensor reading as it is based on capacitance as opposed to conductive resistance. The sensors also have a temperature sensor and a clever means of detecting light levels as well. The sensors communicate over i2c and the i2c address of each sensor can be reassigned, so you can chain many of them together. The sensors can be powered from 3.3V to 5V and connect to the Pi's i2c bus on GPIO pins 3 and 5. The i2c bus will need 10k pull up resistors to work effectively - please refer to the schematic towards the end of this section. *** I had a small issue with the sensors where the i2c address was reassigning itself to random numbers on power up. The documentation for the sensors mentions that this can happen if you "hot plug" the sensors with the Pi powered on. We think this is down to the Hologram Nova causing a small power dip if it is connected when the Pi is powered on, we noticed that if you connect the Nova when the Pi is powered on then it can cause the system to restart. We got around this by powering the sensors seperately from a 5V regulator, but you could probably use a powered USB hub for the Nova as an alternative. See the Tindie page for the sensors here: https://www.tindie.com/products/miceuz/i2c-soil-moisture-sensor/, and Ageir's chirp-rpi GitHub repository maintaining a python class for the sensor and with lots of useful commands. The reservoir has a water level sensor from Seeed Studio, which is a float containing a magnet and a reed switch. When the float is close enough to the reed switch it will close so you can use it just like a normal switch or button. We use a 10k pull-down resistor so if the when the float falls too low the switch opens and the GPIO pin on the Pi will be pulled low (we were previously using a crappy rain sensor which essentially did the same thing). For a small system like ours, a ULN2003a darlington array should be sufficient for driving a motor and solenoid valve (depending on the current required for operation). The ULN2003a is a DIP package and has 7 npn darlington pairs with the collectors available on individual pins. A logic input pin is associated with each darlington pair and can be activated with logic level signals as low as 2 volts. You could attach 1 pump and 6 solenoid valves to one of these chips, and simply add another chip if you want more valves. The gates are designed to sink current, and are pulled low when you set the associated logic pin high. The collector current of each pin can sink up to 500mA, if you have a pump that pulls more current then you can simply link two collectors (and logic inputs) in parallel. The ULN2003a is also very useful for having pretty much all the protective circuitry needed with internal diodes, greatly reducing the risk of damage to your microcontroller. See the ULN2003a datasheet. We experimented with a range of different DC pumps and for a variety of reasons from leaks to faulty parts we are yet to settle on a particular model. We liked a peristaltic pump initially because it had a convenient connector for our early 6mm tubing. A peristaltic pump operates on a similar principle to an organic organ, which will squeeze fluid down a tube to move it from one place to another. Inside the pump is a piece of tubing that is squeezed by a rotating piece, creating a vacuum and suction inside the tube. This means the pump can source water from the reservoir without needing to be submerged in it. The pump operates at 12V and pulls about 450mA - I was concerned that this was a little close to the collector-current limit, so I used two pins in parallel on the ULN2003a. BCM23 / GPIO16 activates buffers 3 and 4 on the ULN2003a. It is now looking like we are going to use a diaphragm pump like this, but it is a crazy step up in power so we may need to change to a pin on the Pi that is PWM capable to drop the motor speed!! Remember the ULN2003a buffers should sink current, not source it, so connect the positive pin of the pump to 12V and the negative to the ULN2003a collector. Make sure you know which tube is the input/output on the pump! After failing miserably at 3d printing our own solenoid valves, we picked up some from Adafruit. These work really well and have a rubber diaphragm seal inside which makes all the difference! The diaphragm also acts as a one-way valve. The valves are also normally closed, and as such they only need to consume current when they need to be opened. The solenoid will activate when 6V - 12V voltage difference is applied across the pins - just like the motor, connect one terminal to the 12V rail, and the other end to a free collector pin on the ULN2003a. I use buffers 5, 6 and 7 on the ULN2003a for three seperate solenoid valves. These buffers are activated by setting BCM pins 14, 15 and 18 (or GPIO 8, 10 and 12) to go "high" on the Pi. WARNING: You need to use a detachable connector for the i2c sensors, I used breadboard type male/female header pins. They all have the same i2c address by default so if they are all connected before you reassign the address, the Pi won't be able to differentiate between them! As you can see in our prototype, pretty much everything can be removed from the proto board. We use a Raspberry Pi Zero W which is perfect for the application, it is low cost and it has plenty of capability to expand on this project further with more sensors or solenoid valves. If you have a new Raspberry Pi and need to set it up then please follow the steps here. If you have a model Zero W like us then setup is a little more challenging than with a standard Pi - but there are some good tricks to making the process fairly painless. You will need a micro SD card, a seperate computer to configure the Pi (I'm using an old MacBook Pro) and a USB power source. The Pi Zero W requires less power than the Pi 3, and I have had no problem powering it from my laptops USB port, otherwise micro USB chargers for phones are fairly generic and easy to find in stores. Also, make sure you have a way to connect the micro SD to your computer - I have a USB adaptor that covers lots of formats, which is super useful as the SD port on my ageing MacBook is very unreliable. I work entirely "headless" which means I never use the Pi Zero W with a display, I do all my work remotely through an SSH connection with my MacBook Pro. If you want to work on the Pi directly, you will also need a HDMI display, a mini HDMI to standard HDMI lead or adaptor for the Pi, a USB keyboard (and mouse) and a USB adaptor to use the Pi's micro USB port. Personally, I find this is quite an inconvenient way to work so I don't recommend it! Follow the instructions found in the link in Step 1 to burn the Raspbian Stretch image to the SD card. On the Mac there is now an app called Etcher which makes this process super simple as you won't even need to unzip the image. This takes a little time, so make a nice cuppa while you wait. If you just finished burning the image onto the SD Card, you will need to remove it and reinsert it in order for your system to detect it again. This will create an empty file called ssh. When the Pi boots up, it will see this file and will activate SSH in response so you can connect remotely. Here's a little trick I have used once or twice - you can also use most smartphones as a Wifi 'hotspot', you can connect both your computer and the Raspberry Pi to the hotspot to establish a connection between them, a handy trick if you don't have a network you can access, or one that has advanced security. You should be prompted by your computer that it is connecting to an unfamiliar device and do you want to continue? - type Y. You should then be asked to type in a password - this is the default Raspberry Pi password which is "raspberry" - type it in and press return, and you are in! Go to 5. Interfacing Options and make sure i2c is enabled, we will need it for the i2c soil moisture sensors. While we are here, you can change your password and user name if you wish, I also went to Boot Options and set the Pi to boot in Command Line Auto Login, to make sure it wasn't opening up the desktop in the background. That's everything we need for now, let's move on. This should return the version of the SDK you just installed. Before you go any further with the Nova as a network interface, you need to activate the Sim Card - follow the instructions on the hologram website found here: https://dashboard.hologram.io/activate - you will need to create an account with hologram.io as well. In the device options, navigate to the Configuration tab, scroll down to find the section that says "Data Engine" and click on "+Show Device Key"
Save the key in a text file somewhere as we need to use it later. Now we can test the Hologram Nova works as a network interface. Plug the Sim card and provided antenna into the Hologram Nova and plug the Nova into the Raspberry Pi via the micro USB port. The official Hologram quickstart guide is here. So long as you don't get an error message, then you are good to go! ThingSpeak is a cloud service which has an easy API and is great for displaying data and performing analytics. You can set up a basic account for free. Navigate to the ThingSpeak website here https://thingspeak.com/ and click on the "Get Started for Free" option, which will guide you through setting up a MathWorks account. Once you have registered, you can create a new Channel. Once you have filled in the fields, scroll to the bottom of the page and save the channel. The channel becomes live immediately, but you can update the configuration or reset the data at any point. You can see how my channel looks here: https://thingspeak.com/channels/393003 there isn't too much to see as we haven't actually started growing things and we are still tweaking the system. Before we move on, we need to get the channels API key for writing data, navigate to the "API Keys" tab and save the 16 digit Write API Key somewhere so you can use it later. Type "ls" to see the contents of this folder. There are 3 scripts that are core to the project, main.py, watering.py and sensorReading.py. I have included the python class for the Chirp! 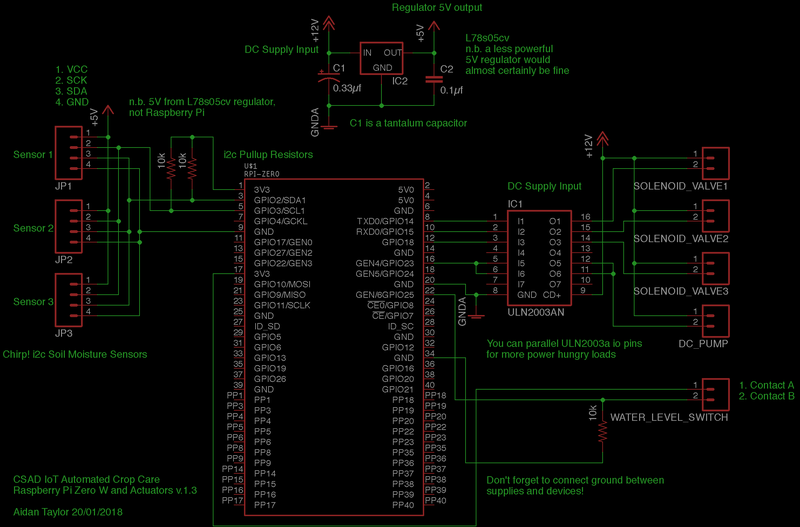 i2c Soil Moisture sensors by ageir and also a script so you can reassign the i2c address of the sensors. The main.py script is the program you will normally want to run, and it will access sensorReading.py and watering.py when it needs to. At this point I assume that you have built the circuit as described in the electronics section, so before we move on we need to assign the i2c address of each individual sensor. It is important to not plug in the Chirp! sensors when the Pi is powered on as this can scramble the i2c address, so with the Pi powered off, attach one of the Chirp! sensors and then power on. You should see the reading from all the sensors, including the water level switch if you have it attached which will be outputting 1 or 0 every other line. Oh yes, you can also calibrate the sensors from here - I tested the difference between the sensor reading in open air against it being dunked in a cup of water. You can set the min/max value for each sensor in this script. You need to press ctrl-c to break out of the loop. Once you are satisfied that things are working, open up sensorReading.py with nano again and change "testMode = 1" back to "testMode = 0"
Don't forget to return to the script and set testMode back to testMode = 0 when you are done. If everything is working - great! There's only one thing left to do now and that is to set up the main script so it is linked to your ThingSpeak channel, your Sim card and it knows which mobile phone(s) to send warning messages to. You need to include the national code in the number, so a UK number would look something like "+44776654321". (In the next update I will just make this a field at the top of the script). Once you have made these updates, press ctrl-x and save the script. There is a short pause at the start of the program (the terminal window should prompt you on what is happening) as I think the Hologram Nova needs a little time to reconnect to the network after a text is sent. Observe the LEDs on the Nova to get an idea of which state it is in. The terminal window should inform you if sensor data has been successfully sent to your ThingSpeak channel, and should also give you live readings. The default cycle time is 15 minutes, it really doesn't need to be faster than that! But if you want to see a bit more activity for testing purposes, change the cycleTime field in main.py to something like 10 (10 seconds). If everything is working, great work! The aim of this project is to allow for it to run remotely, so it needs an autorun script, so it keeps on doing what it is meant to in case of a power cut or some other kind of power failure that causes the Pi to restart. You don't have to do it this way but I would recommend that you install a command line tool called tmux to do this. Tmux will allow you to create a virtual terminal session that the script can run in. This means you will be able to SSH in to the Pi and easily access the running script to check the message prompt, or you can work on other things whilst the script runs in the background. You should find that you are back in the tmux session, with your script still running, neat! What's even better is we can automate all of this with a very simple script that will run shortly after the Pi boots up. Once the Pi has restarted and you are able to SSH in, you should be able to use "tmux attach" to switch over to the tmux session that started running after boot - also, if you set up your mobile number in main.py, you should have received a text to inform you the script started. And we are there! That's the lot folks, now it is over to you to develop this system to suit your own gardening needs. If you look through the scripts main.py, watering.py and sensorReading.py, you should see that it is easy to iterate the software if you want to add more sensors or pumps - if you want advice on doing this, please ask in the comments below. This is our first hackster.io project and we would really welcome any feedback you have - we are still developing our planter as well (aka plugging leaks!!) so stay tuned for updates and we welcome any advice and pointers on improving the hardware and software!